It’s Monday again, another week has gone by, here’s what’s been going on. Really cold…like 14 degrees cold!! Had a little snow over the weekend, not even an inch. Home made brownie (see recipe below) and coffee with Sweet Cream Creamer. The piles of snow have been refreshed, with a new blanket of white. With the construction going on behind our house, and the windy days we had, left the snow really dirty, and yucky. Hate when that happens. Just waiting for my dinner to be complete, this is why I love slow cooker recipes!! Kids have been taking it easy, we took the day off for President’s day. So it’s a little more cluttered than usual, with Legos of course. Lesson plans for the rest of the week. I have been asked by my friend Holly to join her and Caryl McAdoo’s Facebook Group as an eVALUator, where I will receive new releases and then review them. These are my first two; I will be posting reviews on my blog as well as Amazon once I read them. 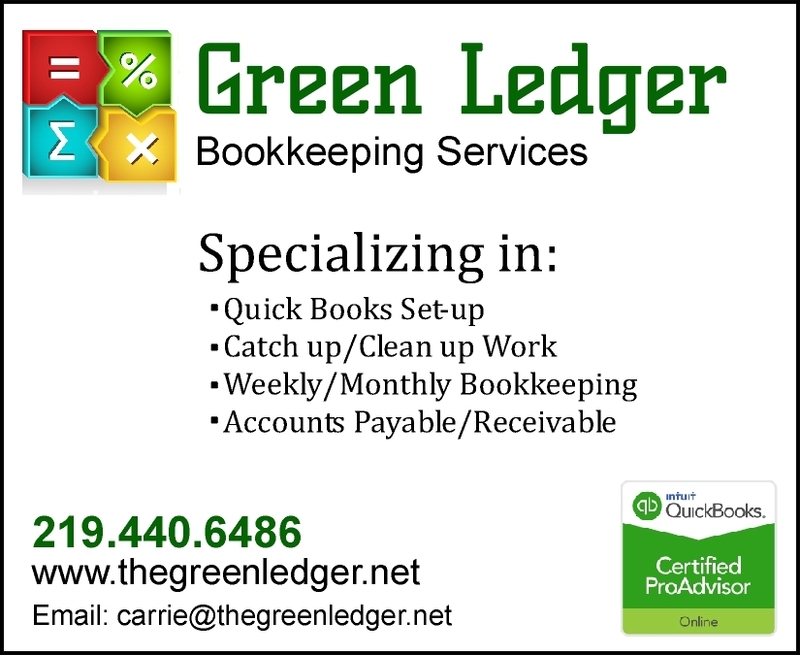 Looking forward to reviewing some books. I rarely watch my TV shows on their actual days. I watch them on my laptop when I get time. I caught up on Castle from last week, and it left us hanging until this week!! Very good though. My two youngest and I have started watching Duff Til Dawn on the Food Network. Two teams work all through the night at Duff’s bakery to create a cake based on the theme they receive before the contest. The winner goes home with the Golden Whisk!! So much fun, Duff is the owner of Charm City Bakery and had the show Ace of Cakes some time ago. So fun to watch. Tonight we will watch the Kids Baking Championship on the Food Network. These kids are incredible bakers!! I hate the competition part, when one is eliminated each week, so sad. 😦 (I am so not the little league mom, I hate seeing the kids disappointed). My youngest son and I created a Rainbow in a Jar as a Science experiment the other day. 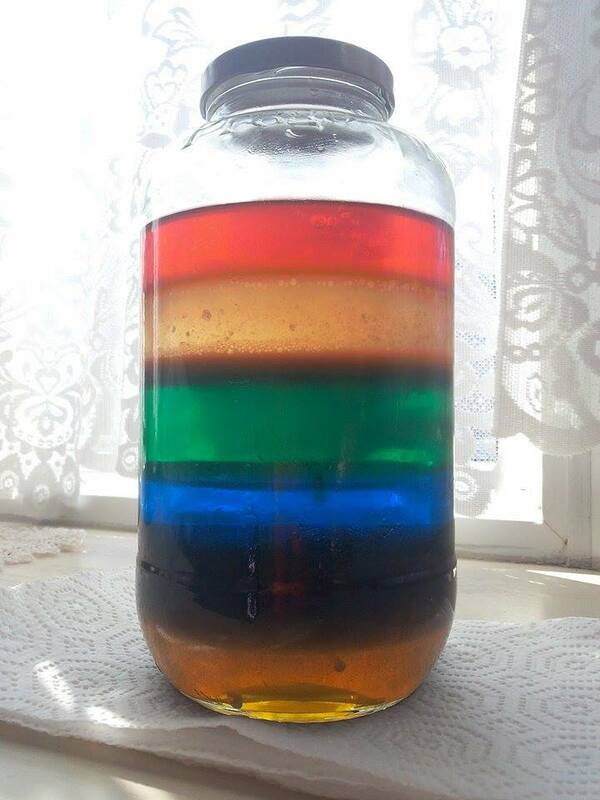 I saw it on Facebook, and I thought that looks easy enough, and he really enjoyed layering the different liquids on top of each other, and adding food coloring and seeing how it responded in the different liquids. It was a lesson about density. This was the end result. I tried Carrie’s Snow Cocoa recipe at Northwoods Scrapbook. This was so delicious. I made it along with home made brownies (recipe below). This would be a wonderful drink for a holiday party since you make it in the slow cooker and you can just leave it there. This brownie recipe came from the book that I was reading, A Second Chance Café by Alison Kent. I love books that include recipes!! Preheat oven to 325 degrees F. Grease or spray with cooking oil and flour (or line with aluminum foil) a 9 x 13-inch baking pan. Sift flour, the salt, and the baking powder into a bowl and set aside. Melt the chocolate and the butter in a double boiler (or in a microwave), stirring often so as not to burn the chocolate. Mix the sugar into the smooth chocolate mixture. Add the eggs one at a time, whisking after each. Stir in the vanilla. Add the flour mixture, folding with a rubber spatula. Pour the batter into the prepared baking pan. Bake 30 – 35 minutes, or until an inserted tester comes out mostly clean. Cool completely before cutting. These were very good, nice and moist but with the light slightly crunchy top. My daughter and I were out the other day and drove through the park by the lake. We got out and she took pictures of the frozen lake. (I actually only got out once, it was so extremely cold). This is the beach. 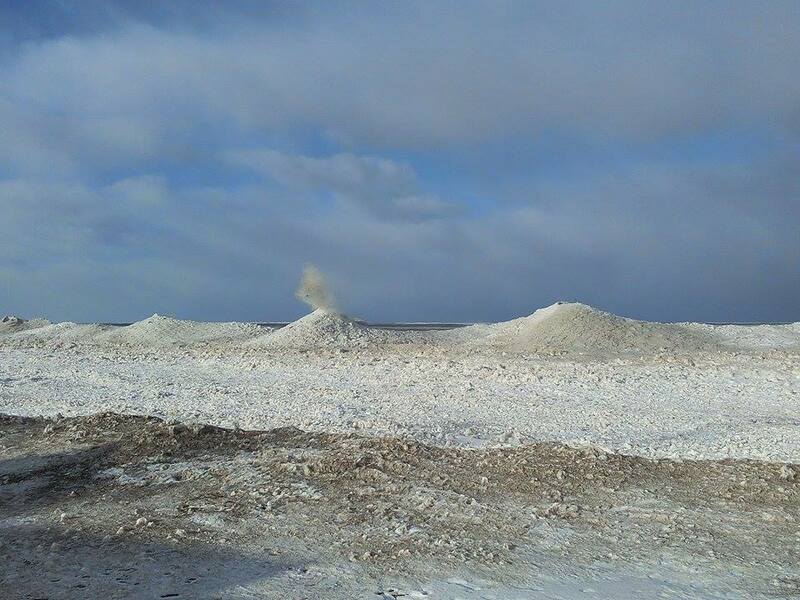 These huge mounds have formed from the waves constantly crashing up against the packed ice and snow. 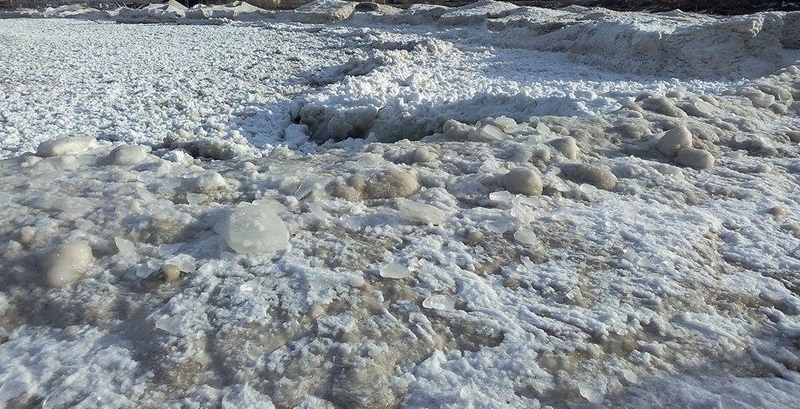 The waves were actually still able to move under all these chunks of ice. 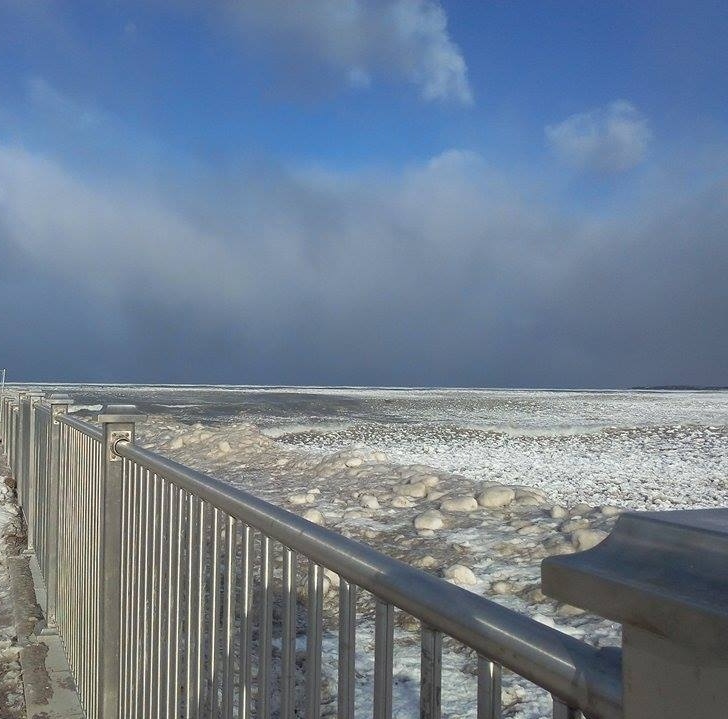 It was something to watch the waves with these large chunks of ice rolling towards the shore. Yes…it was actually colder than this looks!! Brownies for breakfast? That’s my kind of breakfast! Those photos are so pretty but yes, it does look very cold. Hope you have a lovely week! So many goodies you have today!! First, I love Duff and started watching that show too! Great minds…. Next, love that density exercise! One of the prettiest experiments I’ve ever seen. Also, love that brownie recipes. Sounds so easy and yummy!! Will write that one down. And I’m so happy you liked the cocoa – and it is a great one for a party. Lastly, your photos are incredible! The power of big water is amazing isn’t it? So cool.